The Journey to Redemption: The Night the Lights Went Out in . . . . . 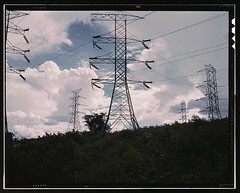 Image via Wikipedia August 17, 2003 -- What began as a handful of commonplace, summertime "trips" brief transmission line shutdowns, usually due to ebbing voltage caused by anything from a bird hitting the lines to a power overload set off the biggest outage in U.S. history. Fifty million people lost power in eight states and parts of Canada. In an uncannily similar event to the US blackouts, on August 28, 2010, London is hit shortly thereafter. Mayor of London Ken Livingstone said at least 250,000 people were affected. "We've never had this catastrophic failure before and we clearly can't have it again," he said.